Now, in this article/blog, I'm talking about dealing with a 1099-C that you may (or may not) receive after an unsecured debt such as credit cards, personal bank loans, medical bills, etc. has been settled for less than the balance. By the way, don't be surprised that your tax preparer or accountant is not quite sure what to do with the 1099-C! Or, be careful if they just say that you have to include the settled/forgiven amount as additional taxable income without seeing if it can be excluded!!!! ALSO, DO NOT IGNORE THE 1099-C, even if you receive it AFTER you have filed! If this happens, you may have to file an amended form. You accountant or tax preparer will help. Ok, so you have received the 1099 C.... NOW WHAT? The actual balance at the time of settlement was $ 3,440 and the total settlement was for $1,500. Even though this was a reduction of $1,940, the creditor has excluded the added interest and fees in reporting the settlement to the IRS. "However, according to IRS Pub. 4681, you may not have to include all of the canceled debt in your income. There are exceptions and exclusions, such as bankruptcy and insolvency." Do you see the word, "INSOLVENCY"? This is the key to the whole matter. It means that if at the time the settlement was completed, if your liabilites (all outstanding debts including the one that was settled) were greater than all of your assets (equity in your home, car, cash, bank accounts, etc. ), then, according to the IRS, you were INSOLVENT. So how do you show/prove to the IRS that you were insolvent at the time of the settlement? You are going to file IRS Form 982 along with your tax return. I lost my job in August of 2014 and did not find employment until a year later. My wife was also very ill at that time. We used credit cards to try and make ends meet, but ultimately were unable to keep up with the payments. Rather than file for bankruptcy, we tried to negotiate with our creditors for a reduction of the balance. As you can see from the Assets vs. Liabilities worksheet I've attached, we were in real financial trouble and/or insolvent. 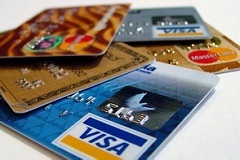 For credit card and other unsecured debts, you only have to deal with Part I. That's it! Nothing to it! Attach/include, all of the above with your tax return. What is a 1099-C and What to do About it! Debt settlement is an option that we use and you can use to help avoid bankruptcy and become free from the burden of too much debt. Basically, is a debt settlement, the creditor or in most cases a debt collector who has purchased the debt agrees to accept an amount far less than the actual current balance. If the "forgiven" amount is greater than $600, then the creditor or debt collector may report it to the IRS. They don't do it in every case, but you need to be aware of what to do about it if it happens to you! There a couple of different looking 1099-C forms. Here is an actual form one of our clients received and I'll walk you through the process of how to file the proper forms to exempt the settlement/forgiveness when you file your taxes. The actual balance at the time of the settlement was $3,041 and the settlement was for $788, saving this client $2,253! The 1099-C reflected this and you can see that in box 2, the amount is being reported as "Amount of debt canceled". If this client did not file the proper forms with her 2014 taxes, she would have had an additional $2,253 added in as additional income and based on her 30% tax bracket (average net federal), she would have to pay an additional $676 of tax! According to IRS publication 4681, she needed to prove that "at the time of forgiveness (settlement), she was INSOLVENT. All she (and you) needed to do was to list all of her assets vs. liabilities to see where she stood. This doesn't have to be a "fancy" spreadsheet or anything, but just write down (again, at the time of the settlement/forgiveness) your assets/equity on one side and your liabilities/debts on the other. It is clear that her Liabilities were greater than her Assets, therefore the amount forgiven should be exempt from taxation. In Part 1, on line 1a, she marked the box with an "X". In the same Part 1, on line 2, she wrote in the amount that was forgiven, $ 2,253. That's all on the Form 982. She could have just included that with her tax return and in most cases, that would have been sufficient. But, I recommend writing a brief, legible explanation of what caused your situation, etc. Again....very brief neatly written (doesn't have to be typed). In 2014, I was laid off from my job of 15 years! As I looked for work, I had to rely on credit to get by. 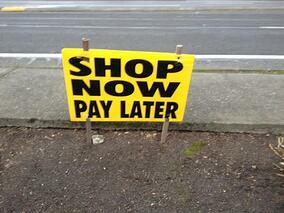 When it got to the point that I just couldn't keep up with the payments, I considered bankruptcy. Fortunately, the bankruptcy attorney I went to see referred me to a Debt Management Company who helped me pay off and/or settle my debts. Make a copy of these along with your tax return for your files. Mail your tax return along with the documents above. If a creditor is willing to accept less than the full balance due (called debt settlement), the IRS calls this a "forgiveness" of the debt. If this amount is more than $600, the creditor or debt collector who owns the debt must report the "forgiveness" to the IRS. Then, the IRS will send you a 1099-C Form. This form states that a certain amount was forgiven by the creditor and that you must include the forgiven amount as "other income" when you file your taxes. "Do not include a canceled debt in income to the extent that you were insolvent immediately before the cancellation. You were insolvent immediately before the cancellation to the extent that the total of all your liabilities was more than the FMV(Fair Market Value) of all of your assets immediately before the cancellation. For the purpose of determining insolvency, assets include the value of everything you own..."
At the time of the "forgiveness" or settlement, you were INSOLVENT and therefore, you DO NOT have to include that amount as additional or "other income"! A copy of your Assets vs. Liabilities worksheet (can be on yellow pad paper!). I've been helping people deal with debt issues for over 12 years and have only had a couple of people have to include any "forgiven" amount as additional income! Don't be surprised if your CPA, tax preparer (especially the H&R Block types) or accountant does not really understand how to deal with a 1099-C. I've assisted dozens over the years and have put together a 1099-C instruction packet that you will find very helpful! What to do if you receive a 1099-C after a Settlement? If you have had a debt settled for less than the total balance, you may receive a 1099-C. You may or may not have to pay any additional tax. When you settle a debt for less than the full balance due, and this is for $600 or more, the creditor or debt collector may report this to the Internal Revenue Service. I say "may report" because they don't always report a settled or "forgiven" debt. Over the past decade that we have been helping people get out of debt, it seems that in the last year or so, more and more creditors and/or debt collectors are reporting settled or forgiven debt. I have to start out by stating that I am not a CPA or licensed professional tax consultant, so any advice here should only be used to help point you in the right direction. 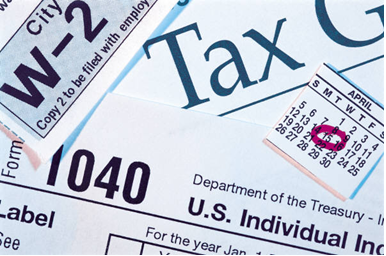 If you do receive a 1099-C, please seek the help of a professional tax consultant! So what should you do if you receive a 1099-C? Let's say that you had a Credit Card that had a balance of $10,000 and because of circumstances beyond your control, you just couldn't make the minimum payments. Most likely, this account was sent to a collection agency after the original creditor made numerous attempts, such as annoying and often harassing phone calls and many collection letters. The debt collector may have sent you an offer to settle for less than the full amount due or perhaps you or a Debt Settlement Company were able to negotiate a good settlement. Using our $10,000 example, let's say that the settlement was for $4,000. The debt collector was willing to "forgive" (in IRS lingo) $6,000. The debt collector reports this to the IRS in order to write that amount off as a loss and you are sent an IRS form 1099-C.
At first glance, it may look like you owe $6,000 of additional tax, but this is not so! You will need to file the proper forms with your tax return to have the settled or forgiven amount EXCLUDED from being added back in as additional taxable income. As usual, the IRS seems to have complicated the process, but in reality, it is not that difficult to file properly. "At the time of the settlement or forgiveness of the debt, were you insolvent?" So, how do you find out or prove if you were insolvent or not? Net DEPRECIATED value of things such as furniture, appliances, tools, etc. remember, even though you paid $2,000 for that refrigerator a few years ago, today it probably would sell for only $200-$300! Net value of your autos, boats, campers, etc. Same thing, NET, DEPRECIATED VALUE! Total all of these up. Possibly Home Equity loan or 2nd you forgot to list before! Add all of these up. Subtract the total of all of your LIABILITIES (DEBTS) from your NET ASSETS. Which is greater? If your Liabilities are greater than your Net Assets, you were insolvent at the time of settlement and therefore, the amount forgiven WILL NOT be included as taxable income. The next part seems a little difficult, but it's not. You are going include these along with your normal tax return. By the way, don't be surprised if your tax preparer seems a little confused as to how to handle a 1099-C. I've had clients pay tax that they didn't need to because the tax preparer didn't file the proper forms. We have prepared a FREE 1099-C PACKET that you can download and use. What happens if your Assets were greater than your Liabilities? You are going to need the help of a qualified, tax consultant or preparer. You still should be able to exclude a large percentage of the forgiven debt, but there may be other ramifications, so I advise you to get help. 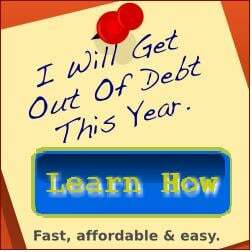 Have you had a debt settled for less than you owe? If so, chances are pretty good that you also received a 1099-C for the amount of the "forgiven" debt amount. WHAT? How can that be possible? Unfortunately, if you settle your debts, the forgiven amount is considered taxable income. However, you don't necessarily have to included it as taxable income. Read on to hear Bob's story and how he was able to avoid paying taxes on his forgiven debt. Bob lost his job and started using several credit cards to make ends meet. He was paying for groceries, gas, and even had to take a cash advance once in a while to survive.Bob had every intention of paying off the cards, but due to our country's severe economic downturn, he could not find a job. Bob had heard about DEBT SETTLEMENT and DEBT MANAGEMENT, but didn't know if he qualified. After a FREE COUNSULING SESSION, it was clear that he could not qualify for the Debt Management Program and therefore chose to enroll in the Debt Settlement Program. After searching the net and talking with several companies, Bob had chosen a reputable Debt Settlement Company to help him settle his debts. His total debt was settled at an average of 40% of what he owed, so his creditors FORGAVE about $13,000 of debt. Because the amount of the forgiven debt was over $600, Bob's creditor reported the settlement to the IRS and mailed him a 1099-C. The 1099-C basically said that $13,000 had been forgiven and he needed to report that amount as additional income for the taxt year the forgiveness was granted. But his Debt Settlement Company helped him understand that he was not going to be liable for the additional income and resulting tax on that income. They provided him with a information about how to file IRS Form 982 and the other documents he needed to provide with his taxes. IRS Form 4681, says that if, at the time of forgiveness, you were INSOLVENT (meaning your liabilities were greater than your assets), then the forgiven amount DID NOT HAVE TO BE INCLUDED as additional income! Since Bob had completed an Asset vs. Liabilities worksheet, provided by his Debt Settlement Company, he was able to completely avoid any additional tax on the settlement or "forgiven" debt shown on the 1099-C! If you have received a 1099-C and need help, we can help, please let us know! 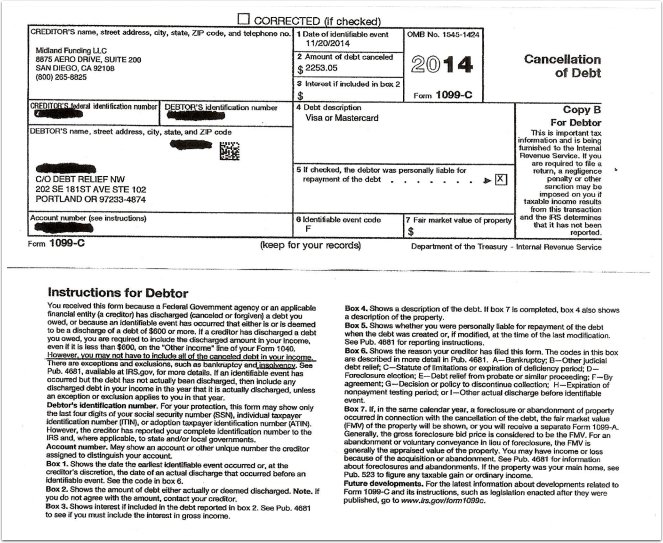 Have you received a 1099-C due to Cancellation of Debt? You received this form because a Federal Government agency or an applicable financial entity (a lender) has discharged (canceled or forgiven) a debt you owed, or because an identifiable event has occurred that either is or is deemed to be a discharge of a debt of $600 or more. If a creditor has discharged a debt you owed, you are required to include the discharged amount in your income, even if it is less that $600, on the "Other income" line on your Form 1040. However, YOU MAY NOT HAVE TO INCLUDE ALL OF THE CANCELED DEBT IN YOUR INCOME (capitalization mine!). There are EXCEPTIONS AND EXCLUSIONS, such as BANKRUPTCY or INSOLVENCY see Pub. 4681...for more details. Most people who have had debts settled (forgiven) have gone through a very hard time, financially. And, most people who have had debts settled would fall into the catagory of INSOLVENCY, according to the IRS and several publications. The bottom line is, if AT THE TIME OF SETTLEMENT your liabilites were greater than your assets, you were insolvent and therefore the amount of debt forgiven would be excluded. We have helped hunderds of our clients to become DEBT FREE through DEBT SETTLEMENT, but we also have assisted them in AVOIDING (or paying very little) ADDITIONAL TAX after receiving a 1099-C.
We have put together a complete 1099-C Kit that will show you (and/or your tax preparer) how to fill out and file the proper forms. I Received a 1099-C, Now What? If you have received a 1099-C, DON'T PAY THE ADDITIONAL TAX until you know your rights! If you or a debt settlement company negotiated a debt for less than the balance due and if that amount was more than $600, you most likely will receive a 1099-C. The 1099-C looks like you will have to pay 100% of the settled or forgiven amount, but this is simply NOT TRUE! However, a lot of tax preparers and even CPA's don't understand this law and how exemptions are calculated. According to IRS Form 4681, there are several exemptions to including forgiven amounts back into taxable income. On page 4 of IRS Form 4681, there is an explanation of "INSOLVENCY". If at the time of the settlement or forgiveness you were INSOLVENT, then the amount of the forgiveness IS NOT INCLUDED as additional taxable income. How do you determine if you were insolvent? At the time of the settlement, you need to show that your liabilities were only equal to or greater than your assets. Net value of your automobile(s), boat, etc. Net value of jewelery, stocks, bonds, etc. Net furniture value, coin collections, etc. For most people who have negotiated a settlement of their credit card or cards, they usually do not have any real assets and therefore the amount forgiven is not included as additional taxable income. You will need to complete IRS Form 982. You will check a couple of boxes and sign, and along with the Budget Worksheet, turn in with the 1099-C and your normal tax return. Once again, don't be surprised if your tax preparer or accountant is not really up on this procedure! You might want to download IRS 4681 for them to review. If you have already filed your taxes for the last two years and if you paid additional tax on the additional income added back into your adjusted gross income, you should file an AMENDED RETURN. If you are still unsure of what or how to deal with a 1099-C, please let us help. 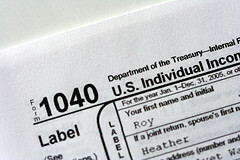 We have helped dozens of tax preparers and accountants deal with the 1099-C issue and would be glad to assist. Do You Have to Pay Tax After Settlement? A client called us the other day and asked, "Do you have to pay tax after settlement?" When you negotiate a settlement on a debt you owe, let's say a credit card with a $10,000 balance is settled for $4,000 (yes it is very possible! ), the amount that is FORGIVEN may be added back into your taxable income for that year. At the end of the year, you will receive a 1099-C in the mail that states that the creditor has reported the $6000 of forgiven debt to the IRS (any amount forgiven over $600 may be subject to IRS reporting). What do you do when you receive a 1099-C? First, if your accountant or tax preparer tells you that you will have to pay tax on that amount, you probably need to find a new accountant! Why? It has been my experience that most accountants and tax preparers are not aware or experienced in how to treat 1099-C for settlements or forgiveness. IRS Form 4681 explains that certain amounts of "forgiven debt" may be excluded from taxable income. Basically, if AT THE TIME OF FORGIVENESS, you were INSOLVENT (your debts were greater than your assets), then the forgiven amount IS NOT included as taxable income. Net or depreciated value of your cars, boat, etc. Net value of your jewelery, stocks, bonds, etc. Subtract the DEBTS YOU OWE from your ASSETS. If the number is negative, then you are "insolvent" according to the IRS. Complete IRS Form 982 and check the appropriate boxes to show that this amount should be excluded. The moral of this story, don't think that just because your accountant or anyone else tells you that you must automatically pay tax after settlement, that it is always true.